The oil market continues to hold up dodging some bullets over the last few sessions. Last Friday's monthly jobs report showed a greater-than-expected uptick in the unemployment rate registering at 10.2%. The crude market saw substantial selling pressure as traders bet that higher unemployment will reduce demand. Crude prices fell just over $2 for the day to $77.63 a barrel. Yet, oil successfully held the pivot lows at $76.50 for the day and then bounced on Monday. 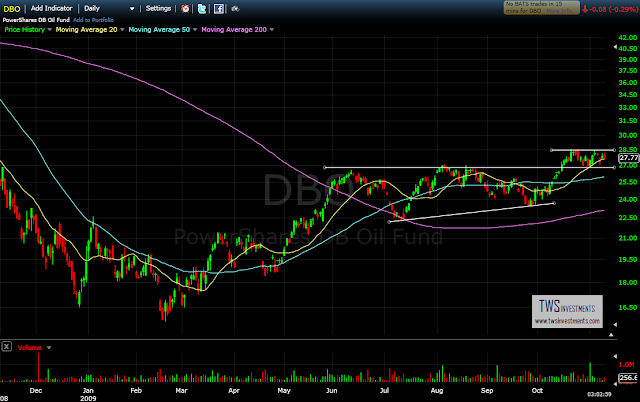 DBO, the oil ETF I am currently holding, also held its pivot lows at $27 and likewise bounced yesterday. Crude pushed through $80 per barrel early on today but a bounce in the dollar and forecast revisions out of the Energy Information Administration brought selling to the market. Once again though, prices held up and rebounded into the close showing continued buying interest on any dips. Tonight's inventory report from the American Petroleum Institute and tomorrow's Department of Energy numbers will likely move the crude oil market. I have a decent position at current prices and I am looking to add through $28.50 in DBO. A failure to hold $27 will be discouraging and clear me out of most of my position. I continue to think oil has broken out of a 4-month consolidation base and has resumed its uptrend. 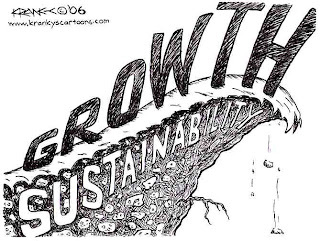 I am expecting continued upside momentum.